This will be my first season growing in Midway, Utah. But having growing in Denver for years at an altitude that is only about 200 feet lower than most of the Heber Valley, it won't be much different as far as technique goes, although the average temperatures are about 5 degrees cooler on average. 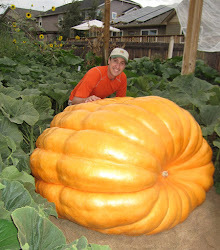 The following are some tips for growing giant pumpkins above 4,000 feet in altitude. Start your seeds indoors in a warm area that gets lots of light. Supplemental light and heat would be a good thing. Start the plant in a pot that will give the roots room to grow. Atlantic Giant pumpkin seeds roots grow really fast. A one gallon pot will have roots top to bottom in two weeks. Usually I start my seeds around April 15th. For competition pumpkins that is required to give the plant enough time to grow. For the more casual grower, maybe start your seeds around May 1st. I'll put out hoop houses (little green houses) a week or more before I plant outdoors to help warm the soil. Plants don't like cold soil. The first week of May, depending on the weather, I'll plant my pumpkin plants in the patch inside the hoop houses. At night I'll add a 100 watt incandescent bulb, space heater or heat lamp in the hoop house to give a heat source for the plant and put a tarp or blanket over the hoop house. The hoop house warms up very quickly in the sun (like a car with the windows rolled up in summer) during the day, but inside the hoop house by midnight it will be nearly the same temperature indoors as outdoors, so some sort of heat needs to be added or else the plants could freeze or not grow as quickly as they should. I keep a little wireless thermometer in the hoop house and as soon as I see it hit around 85-88 degrees I open the flaps up. I try to maintain a temperature between 85-90 degrees as much as I can. I don't like to let it get over about 91 degrees. If you start your seeds on April 15th and the plant is happy, the vines will start to grow around the middle of May. By the first week of June the vines are growing fast and typically my plants are out of the hoop house. By this time of year there shouldn't be much risk for frost so the plant should be okay until September.